1. 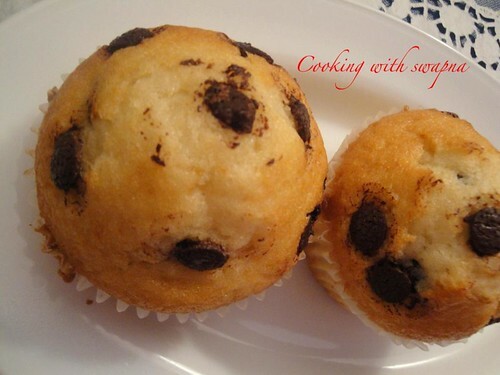 Preheat the oven at 400 F. Line the muffin cups with paper liners or spray with a non-stick vegetable spray. 2. Sieve the flour, baking powder & salt together. Keep aside. 3. Beat the egg. Add sugar, brown sugar, vanilla essence, milk & oil. Whisk till well combined. 4. Fold the flour mixture to the egg mixture. Finally add the chocolate chips to the cake batter, retaining 1/4 cup. 5. 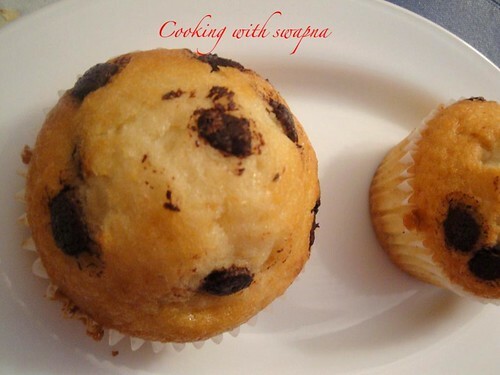 Fill the muffin tins using the ice cream scoop & sprinkle the remaining chocolate chips on the top of muffins. Bake it for 20 mins. 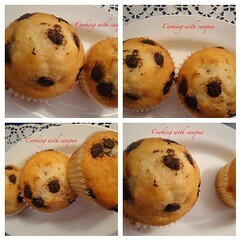 So soft and mouthwatering muffins..
Wow the cupcakes are looking gorgeous nicely puffed up and soft!! !